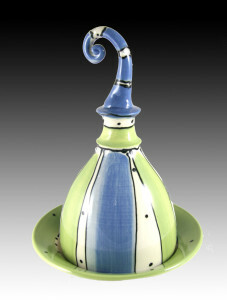 Cori Sandler is a studio potter living in the beautiful West Coast of Canada on Vancouver Island, British Columbia, Canada. As a B.C. potter, my pottery studio looks out onto Baynes Sound in the Comox Valley and overlooks Denman Island and Hornby Island. “As I walk on the beach, I can collect oyster shells by the … well, there sure is an abundance of oysters just outside my studio. My studio and the surrounding ocean and mountains is a place where I make pottery that nourishes the soul and feeds the heart and smiles back at you. 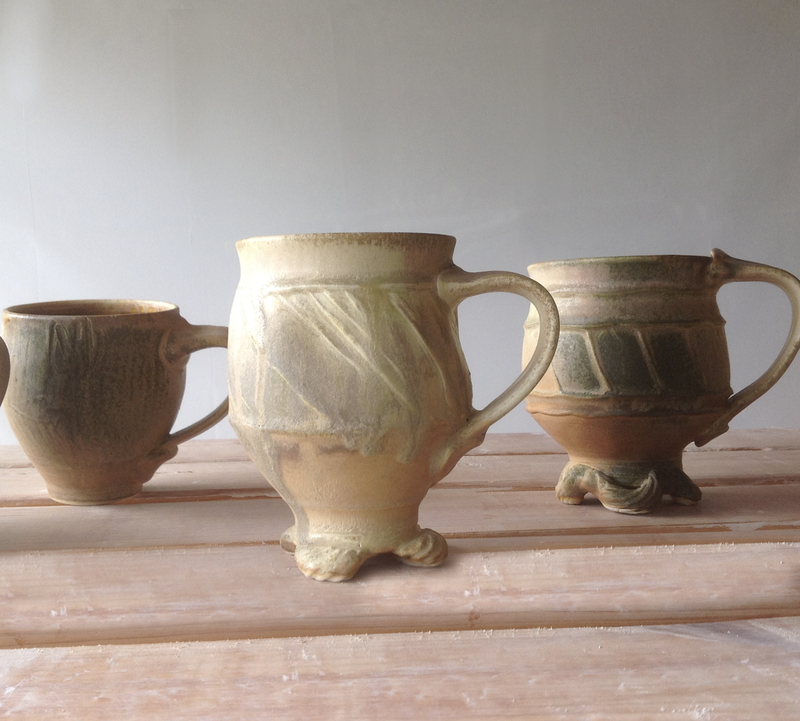 In essence I get to play in the mud all day long and does that ever make me a very happy woman!” Cori Sandler, the woman who moved from big city Ontario to this sea side town on the coast of Vancouver Island, couldn’t be a happier potter. Making pottery all day long, hearing eagles singing and sea lions barking is pretty magical! making the ritual of cooking and eating, sharing food with friends and family & using handmade tableware and dinnerware a beautiful and enjoyable experience. Her cone 6 functional pottery is uniquely decorated. There are a number of series or styles Cori is known for. One contains multiple layers of coloured slips and glazes. 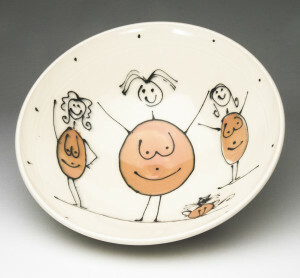 Some of the designs she create on my pottery bring joy and giggles out of those who use them. Or, perhaps your favourite piece gets dusted every onec in a while upon your bookshelf that remains a piece of visual beauty or interest. However, the notion of waking up and strolling into the kitchen for your first cup of tea or coffee when your eyes are hardly open and you know another day awaits you with all the trials and difficulties that you may have to manage… and you have a choice of which mug you are going to pour that first cup of java in, and it is that Cori Sandler mug that you choose to use, puts a smile on Cori’s face. You may have bought from me personally at an art show, or through an online purchase or through a shop or gallery. I truly am humbled that you have chosen to spend that quiet time or perhaps it is fast and furious moment, with a piece of my work in hand, perhaps making those minutes that you have before your day begins a little more enjoyable. 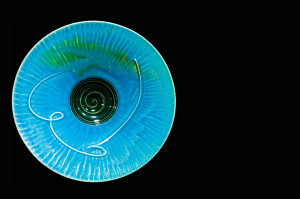 Cori makes bright, fun, funky colourful pottery (all food safe and dishwasher safe) and she also makes pottery that is quiet and somber and asks you, the user, to reflect and take some time to caress the pieces and feel their curves, and textures. The ocean floor seems to have found its way in much of her more recent work. Colours of the ocean have swept their way into her work with shades of blues and turquoise, and of sand and sun bleached driftwood. “My current stoneware and porcelain pottery reflect the image of the texture of the sand as the tide moves over the beach, the movement of the waves, can be felt under the glazes. 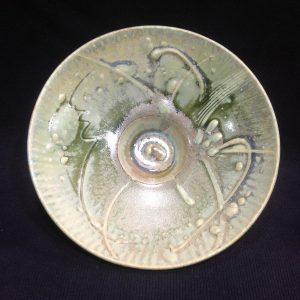 These glazes are rich and deep, and one can spend a long time looking at a piece and seeing something a little different in it each time they look at it.